Running over the next 8 days, Bryant Park Fall Festival presented by Bank of America presents the perfect opportunity to spend an evening in the park soaking up some culture. We've got a variety of performances for visitors to choose from including funk/rock, ballet, dance, opera, and jazz. While you're in the park for Fall Festival, don't miss these other opportunities to improve your experience and round out your evening. City Winery has teamed up with 'wichcraft to provide refreshments during each evening performance. You can expect 'wichcraft's famously fresh treats, paired with selections from City Winery's cellar. Famous for their New York City themed wines and as a cultural venue providing music and entertainment, City Winery will also bring a taste of their space to ours, as they kick-off Fall Festival tomorrow afternoon. Wine and poetry collide in their latest wine series in partnership with the Bowery Poetry Club. Both groups will be in the park tomorrow for a performance of Red Poetry, showcasing the new bottles. While you're here, be sure to visit the Info Booth. In exchange for filling out our Fall Fest satisfaction survey, you'll be entered to win excellent prizes from Fall Festival presenting organizations, who have been kind enough to provide swag and tickets to see Fall Festival artists in their upcoming fall shows. 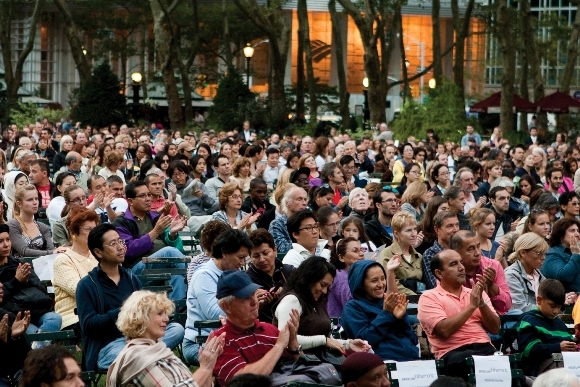 If you're coming to the Festival, be sure to check into Bryant Park on Foursquare. A few lucky Foursquare users will receive an instant upgrade for themselves and a guest to the VIP Fall Festival Experience, including front row seats with sips 'n snacks from 'wichcraft. And don't worry about a babysitter, bring the kids to Fall Festival! We've got pre-performance workshops, designed especially for children, taking place five times throughout the week. Hosted by Kids Club THIRTEEN, these events will engage the kids with hands-on fun, character-themed activities, and visits from the stars themselves like Martha Speaks and Chirp from Peep in the Big Wide World.